If you were an NFL general manager -- or, shoot, just your own fantasy football GM -- and I told you for the rest of this season you could have one of three quarterbacks to start for your team and offered Matt Hasselbeck, Brock Osweiler and Matt Ryan, the choice is easy, right? It has to be Ryan. The Atlanta Falcons were one of the early-season darlings of the NFL with a 5-0 record, but they have dropped four in a row and five of six. They should have lost at home in Week 5 to Washington but escaped in overtime, and the only win in that stretch was 10-7 against a terrible Tennessee team that didn't have Marcus Mariota. The main culprit for this slide is clearly Ryan, to the point that first-year head coach Dan Quinn might have a decision to make soon. And the irony of that is Quinn targeted the Atlanta job all along because the team had a franchise quarterback like Ryan in place. The Falcons were beaten 20-10 at home by Minnesota on Sunday. Ryan wasn't good again, throwing for 230 yards, one TD and two interceptions. A big chunk of that yardage and the only score was in garbage time. He made one of the game's crucial plays by throwing one of those picks in to heavy coverage in Minnesota's end zone. That was his league-worst fourth red-zone interception on the season; Ryan had none last year. In the past seven games, Ryan has 10 touchdowns compared to 11 turnovers. Remember, this guy has maybe the NFL's best receiver to throw to in Julio Jones. The Falcons won't be cutting Ryan or anything. He will make $23.75 million next season, including $18.4 million in dead money - money that would count against the cap whether the Falcons cut Ryan or not. Ryan is set to make $23.75 million in 2017 and $21.65 million in 2018, the final year of his deal. But it's time to wonder if he really is a franchise quarterback. Atlanta is +2.5 this week at Tampa Bay. Here are some Week 13 games and opening lines that caught my eye. As usual, I won't touch on the Thursday game, my Sunday featured game (likely Chiefs-Raiders) or the Monday nighter. Broncos at Chargers (+4.5, 43.5): I mentioned Osweiler above because he is now 2-0 as a starter after Denver beat New England 30-24 in overtime in the snow Sunday night to end the Patriots' chances at another unbeaten regular season. There's just no way now that the Broncos can go back to Peyton Manning, even if he gets healthy, ahead of Osweiler barring injury. 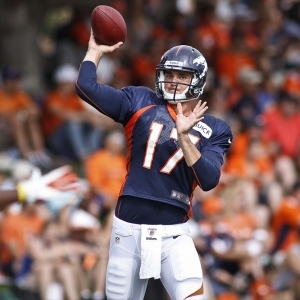 Osweiler isn't perfect as he sometimes holds the ball too long, but he looks like Denver's future at the position. He was 23-for-42 for 270 yards, a TD and a pick against the NFL's No. 1 scoring defense and in pretty terrible weather conditions. He also changed the play in overtime that led to the winning 48-yard C.J. Anderson touchdown run. ESPN's Chris Mortensen reported on Monday that Manning (foot) isn't expected back "anytime soon." I would worry about a major letdown game here in what could be Denver's last-ever trip to San Diego. The Chargers showed some heart Sunday in a 31-25 win at Jacksonville. Antonio Gates had two TD catches and now has 21 career games with at least two touchdown catches, the most ever by a tight end. Key trend: Denver is 7-3 against the spread in past 10 meetings as road favorite. The pick: Broncos, although I'm not super confident about it. Colts at Steelers (-7, TBA): I mentioned Hasselbeck above because he is 4-0 as a starter this year as Indy beat Tampa Bay 25-12 on Sunday for its third straight win. Hasselbeck threw for 315 yards and two touchdowns without turning the ball over -- he hasn't thrown a pick in three of his four starts. He has joined Warren Moon and Brett Favre as the only quarterbacks to win four consecutive starts after their 40th birthday in the Super Bowl era. Neither Moon nor Favre won five straight. Hasselbeck has a season rating of 94.4, which would be 12th in the NFL were he qualified. By comparison, Andrew Luck's rating of 74.9 is 29th in the NFL. What do does Coach Chuck Pagano do when Luck is healthy and if Hasselbeck keeps winning? Remember, Pagano doesn't have a contract after this season, so he might not feel pressure to hand the keys back to Luck. This game could have big wild-card implications with both Indy and Pittsburgh at 6-5; either the Colts or Texans (also 6-5) will win the AFC South. This total is TBA, and the line tentative, because of the status of Ben Roethlisberger, who is in the NFL's concussion protocol. Last year, Big Ben threw for 522 yards and six TDs in a 51-34 win over the Colts. Key trend: Pittsburgh 5-5 ATS in past 10 as home favorite of at least 7 points. The pick: Steelers if Roethlisberger plays. Panthers at Saints (+7, 49.5): Trap game for Carolina? The Panthers were all riled up on Thanksgiving because they actually opened as betting underdogs in Dallas, but Carolina dominated in a 33-14 win and got a few extra days to prepare for the Saints and heal up. If Carolina can somehow finish the regular season at 16-0, Cam Newton could definitely steal the NFL MVP award from Tom Brady. The Cats have won 15 straight regular-season games overall. The New Orleans defense played better under new coordinator Dennis Allen on Sunday, but the offense didn't show up in a 24-6 loss at Houston; it snapped a streak of 155 straight games scoring at least one TD for the Saints and ended Drew Brees' 45-game streak with at least one TD pass. How does that offense only manage six points coming off a bye week? I think it's time for Sean Payton and the Saints to part ways after the season. Carolina beat the visiting Saints 27-22 in Week 3. Key trend: New Orleans 5-5 ATS in past 10 as home dog (any opponent). The pick: Saints cover -- hoping for 7.5. Seahawks at Vikings (+1, 41.5): Still think Green Bay wins the NFC North even though the Vikings now have a one-game lead there. Thus this could be very important for wild-card purposes in the NFC. I fully expect Seattle and Minnesota to take those two spots in whichever order. The Seahawks beat Pittsburgh on Sunday to get over .500 but lost star tight end Jimmy Graham for the season to a torn patella tendon. Graham had 48 catches for 605 yards and two touchdowns. Not huge numbers, but he was Russell Wilson's security blanket on third down. On the season, Wilson targeted Graham more than any other receiver (24 times) on third down. Sixteen of those passes resulted in completions. Graham also has 11 gains of 20-plus yards, which is three more than he had all of last year with the Saints. Key trend: Seattle 5-5 ATS in past 10 as road favorite. The pick: Seattle and love the "under" here. Doc's Sports has been a leader in NFL handicapping for more than 40 years. Now we have a great offer for new clients. Get $60 worth of NFL picks absolutely free. No obligation. Nothing else to buy. You don't even need a credit card. Just click here to get started.